What Makes Our YTT Program Special? Outstanding 20-member faculty of experienced, knowledgeable and certified yoga instructors. Residential program immerses you in the teachings and practice without distraction. All aspects of classical yoga are taught integrating asana, pranayama and meditation. Program is delivered in two segments allowing time to absorb and integrate the practices into your daily life in the interval between sessions. Practice and learn in the serene natural beauty of Canada’s west coast. Delicious, primarily organic meals using produce from our extensive gardens. The Salt Spring Centre of Yoga is a non-profit organization dedicated to passing on the teachings of classical ashtanga yoga. 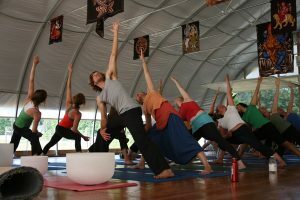 The strong reputation of this yoga teacher training is built on our outstanding 20-member faculty and their dedication to passing on the spiritual teachings that have enriched their own lives. All practice classes are taught by our team of experienced, knowledgeable and certified yoga instructors. Theory classes are taught by a variety of guest instructors who specialize in each subject. The Salt Spring Centre of Yoga is currently a registered school with the Yoga Alliance. Our Yoga Teacher Training program qualifies anyone who completes it to register as an RYT (Registered Yoga Teacher) at the 200-hour level, once all requirements of the Certificate of Completion are met. This foundation program systematically deepens your experience and understanding of the philosophical roots and diverse practices of the classical ashtanga* and hatha yoga traditions. All aspects of yoga are taught as a physical and spiritual discipline, uniting body, breath and mind. Skills will be developed to enable you to teach a beginning yoga class in the three areas of pranayama (classical breathing practices), meditation and asana (postures). Through the interactive nature of the program you build a supportive network, learning from one another as well as from the experienced faculty. * This program is not the same as Ashtanga Vinyasa Yoga as taught by students of K. Pattabhi Jois. The program offers instruction in beginning and intermediate levels of pranayama, meditation and asanas. It is ideal for people of all ages and abilities who want to immerse themselves in a residential program to deepen their understanding and practice of yoga. It is also ideal for those who want to develop the foundation skills to become a yoga teacher. A flexible body free of injuries is not a prerequisite for this training nor is it essential to want to become a yoga teacher. Due to the intensive nature of this training it is not suitable for anyone new to yoga and so a minimum of one year experience in yoga practice is recommended. For those who would like to teach, or for those who are already teaching, this course is designed to expand your knowledge of the theory and practices of yoga as well as to develop and enhance your teaching skills. The total cost for participation in YTT will vary according to the accommodation type chosen. * Shared Rooms have 2-3 twin beds per room. You will be emailed shortly after your application is received to confirm your acceptance into the program. Your student contract will be emailed 1-2 weeks after that. Return the completed student contract.